Tulsa Firearms deals only with the best when it comes to keeping your valubles safe, Superior and Champion Fire Safes. Tulsa's largest selection, visit with our knowledgeable staff and see them in person today. Our sales team is very knowledgeable and can answer any question you may have. "We Deliver with Best Price and Service!" Champion still builds safes the old-fashioned way—heavy and tough with thick American-made high-strength steel! Our gun safes are “built up to a standard, not down to a price.” That’s why our safes are the heaviest, strongest, and most secure gun safes on the market. Superior Safes are built with the kind of quality that you deserve. 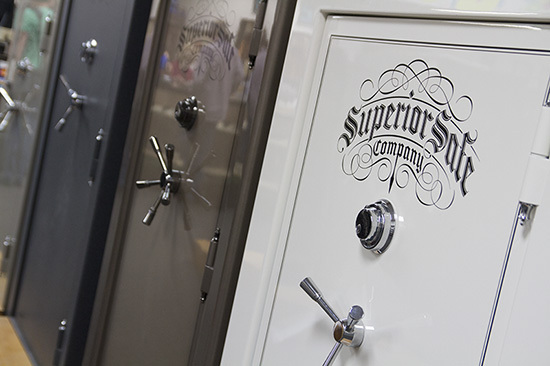 Superior gun safes have the perfect synthesis of strength, fire protection, precision, and extreme elegance. If you are looking to invest in your first gun safe it is important know what really makes a quality gun safe. Simply take notice of the steel thickness, the door strength and design, the boltworks and the overall rigidity and smoothness.